I’ve grown more and more concerned about the advice to ingest essential oils that I’ve been seeing around the internet. I love that more people are getting into natural options. I love that people are getting healthier with the help of essential oils. But I am concerned that not everyone is aware of safe use, and that this could lead to more problems down the road. The good (and bad) thing about essential oils is that they’re extremely potent. Sources estimate they are 50 – 70 times more potent than dry herbs, and that a single drop may be the same as 20 – 30 cups of tea! We know that nothing is safe in excess, and this is especially true when it comes to pregnant or nursing women, or young children. This is why we need to use essential oils with caution. Of course, the strength is also very beneficial at times, too, if they’re used properly. Small doses can have big impacts. They can help you greatly if you are struggling with certain symptoms. And they can be very cost-effective. All the chemical components in essential oils are preserved and ready to use, while they’re very diluted in dry herbs. I use both — but one thing I never do is take essential oils internally. You should know that yes, there is evidence that essential oils are beneficial in health. One blend has been shown to kill the flu virus. But note, in the study, that they were testing amounts between 1:2000 and 1:6000 dilution! Not pure essential oils! This study shows that geranium and tea tree essential oils were very effective against MRSA, but they were used topically and at distance — they were not applied “neat” nor taken internally. This study shows that lavender essential oil may be effective against migraines — again, used as vapors (in a diffuser/inhaled). This study shows that lavender essential oil was very useful in helping episiotomies heal after birth. It used a 1.5% dilution in olive oil. There was one study that did look at the internal use of lavender oil (checking for effects on anxiety). This study used doses of 100 and 200 microliters. 20 drops is the equivalent of 1 mL (roughly). One drop is .2 mL, and 200 microliters is .2 mL. So, they were testing the effects of 1/2 – 1 drop internally in a carrier oil, inside of a capsule. Interestingly, this was the only study that did not find strongly positive effects. There were many more studies than that (you can search for any essential oil you want followed by “pubmed” to pull up the studies for yourself). Look, essential oils work. There’s plenty of evidence of that, for many different health issues. They’re a good thing — and it’s why I have several. But they are incredibly potent. That’s why, in these scientific studies, they were not used at full strength (or even close to it) and they were not usually used internally. They are so potent that they are effective as vapors in the air, or diluted to 1 – 2% in a carrier oil (or even less). There wasn’t a single study in all the ones I pulled up — and I didn’t link all the ones I read here — that studied undiluted, internal use. So why are so many people casually recommending using them internally? The truth? People don’t have a clue where to get quality information about essential oils. A lot of people are getting the information from essential oil consultants, who are not experts in essential oil use. Plus, some of these companies are recommending very casual use. One company cited no scientific studies, and yet recommended using 2 – 3 drops of oil undiluted on skin (with no notes about which are safe, or on whom) and also recommended putting a drop directly onto the tongue to swallow! The same source said to put “several” drops of oil into a capsule and swallow. That would be a huge dose!! There are no contraindications mentioned, no cautions, no different recommendations for children or pregnant women, no notes about using specific oils differently. Basically, there is absolutely no safety information, leading the average reader to believe that essential oils are so safe that they can be taken by anyone, any method, in any dose, and be just fine. And that is not the case. An even bigger problem is that many are recommending these practices — adding oils to capsules or to water (which will not disperse the oil, since oil and water don’t mix) — daily, as health-boosting or preventative. In my opinion, essential oils are medicines and should be used as such. They should be kept for when they are needed and used in the smallest effective dose. But we’ll get to that in a minute. It’s no wonder, if the majority of the information people are getting is coming from these companies, that they think essential oils are just safe in any dose, any method! This makes me very, very nervous. This is not appropriate safety or use information. One source did say it’s “fine in small doses,” but as noted above, undiluted essential oils are never small doses because they are extremely potent. In contrast, recognized expert Robert Tisserand says that internal use can be okay, if the oil is diluted to 1 – 5% in a carrier oil and put into a capsule. He recommends, though, using these only for specific conditions when needed, not for “prevention” or just because. And never in water! But. In general, you shouldn’t use essential oils internally. Especially not so casually. If you’re under the care of a professional aromatherapist who is treating you and recommending essential oil use internally, then you can skip this part. 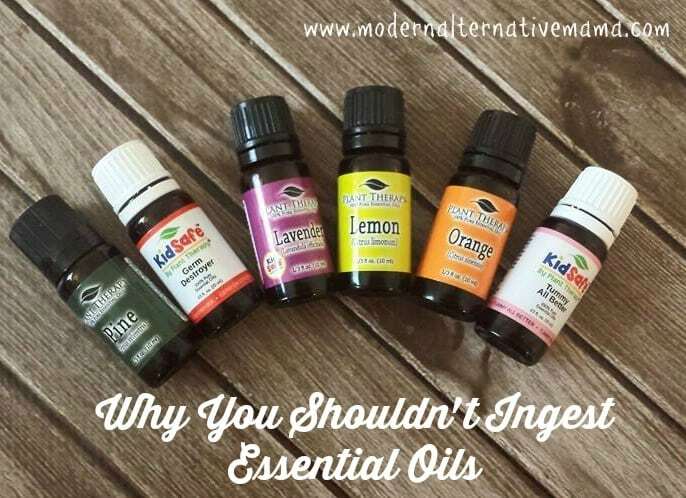 If, however, you are using or planning to use essential oils internally because someone told you it was a great idea, or could help you lose weight, improve your immune system, etc. and that it basically has no side effects — you need to keep reading. Think about how potent those oils really are. Would you dose yourself or your child with 20 or more cups of tea in a single day? Most likely not. So why would you put a drop of oil that was the medicinal equivalent into a child’s drink, or your own? This is especially true if you are just using them for “flavor” or are using them daily for overall “improved health.” And it’s even worse if you are using multiple oils (and therefore, multiple drops of oil). These are massive doses. Instead, try squeezing real lemon or grapefruit juice into your water. Prepare teas from whole herbs. Put the oils in a diffuser so you can breathe them in. Mix them into a salve or oil roller at a 1 – 2% dilution. Use the oils primarily when you have a specific need, and stick to herbs or whole fruits and vegetables for preventative measures. Because essential oils are so concentrated, drinking them can actually harm your body, especially in water. There have been reports of citrus oils causing burns in the mouth or throat, or harming the acid balance in the stomach (because they’re highly acidic). If you drink them in water, they’re not dispersed at all — because oil and water don’t mix! In one swallow you’re getting more concentrated amounts of plant chemicals than you’d get drinking 20 – 30 glasses of water with citrus juice squeezed in (probably more). Some others have reported long-term body chemistry issues from consuming essential oils internally. This is why it is important to get professional advice and monitoring when taking something that is so potent! Guess what? Essential oils can kill bacteria and viruses, as noted in the beginning. But this means that they can kill good gut flora, too. That’s why they should be used very cautiously and as medicine. You don’t want to mess up your gut flora by using them frequently! For the record, this is also an issue with certain herbs. No natural medicine should be assumed safe. There are certain herbs that you can take pretty much as much as you want to (like fennel, ginger, ones that we use often use for kitchen spices) in relatively small doses with no issue. But super-concentrated is never good for frequent use. Bottom line? Essential oils are effectively medicine, and should be treated as such. Nobody should be recommending ingesting essential oils on a regular basis, ignoring safety recommendations (such as that certain people shouldn’t use certain oils), and recommending using them undiluted. They are far too potent for that. Be aware of who should and shouldn’t use different oils. Use them safely in a diffuser to make your home smell nice, lift your mood, or kill germs. Don’t self-diagnosis or prescribe oils internally for serious conditions…and don’t listen to others who say you should, especially if they’re selling you oils. Just be smart about this, okay? We choose to buy from and work with Plant Therapy. They’re a company that’s committed to quality, easily affordable, and they take safety information very seriously. They have turned to Robert Tisserand to create their blends and write their safe use guidelines. I trust that. And no, I don’t receive any affiliate commission or any per-bottle fee if you choose to buy from them, too. I sought them out on purpose after reading so many confusing things about essential oils and all the different companies that are out there, and came to realize that they met the needs I had. Almost all the oils I have from them, I purchased myself — they weren’t free samples. I suggest seeking out an oil company like Plant Therapy, whom you can trust, and who will give you clear safety information and err on the side of caution. Their prices are lower and they recommend much more cautious and infrequent use — that affects their bottom line, but your safety is more important to them than anything else. I recognize that although I’ve not called out any specific company, that many will know which companies I’ve referred to and may have an allegiance to one of those companies. I know that many will disagree with my stance here and may even be upset about it. Please be respectful in your comments. Please do not trash, nor promote, any particular company. Please do not leave links to your essential oil business. I won’t publish any comments that don’t meet these guidelines. Essential oils can be extremely controversial, but we can have a mature discussion about this. Although this post is sponsored by Plant Therapy and I do have an ongoing business relationship with them, you should know that I get a flat fee per post I write. Whether or not you buy from them does not change my compensation, so I’m not going to push specific oils on you. Plus, as I mentioned, they’re the company I actually buy from personally, and I reached out to them after buying and trying their product myself. I don’t consider myself any more “biased” than anyone else who has found a company or product that they trust and prefer. Also, I would have written this post either way. It’s an issue that’s concerned me for awhile, and that’s true regardless of which oils a person is using or which company they choose to support. I have to agree with you. December 2013 I started using and selling oils for 1 of the big companies. Felt like I had did my research, read books, listened to podcast watched videos. I was using the oils undiluted and internally and felt great all the time and only caught 1 cold that lasted for about 2 days compared to my normal 4 to 6 colds per season. After about 6 months I took a raindrop class I started getting eczema on my hand the first time I’ve ever had eczema in 33 years of living. it was so bad on my finger I could not wear my wedding ring for 3 months. summer ended and it seemed to get better then I started getting rashes on my chest and my back big patches.I went to the doctor and found out its eczema. I was still using essential oils and I never would have thought that the rash was from the oils. so I went to see a dermatologist and that’s exactly what he told me. The eczema was from the oils. My chest and back were my favorite places to use the oils. Not sure why I had eczema on my ring finger though. It’s been about 4 months and the eczema is almost gone. I still get small patches on my chest. I haven’t used oils at all since then. I miss them and hope to be able to use them again. Thank you for your post, I commend you greatly! I’ve never ingested EO’s and have been quite leery of the whole idea of doing so. I want to thank you for all of your posts/information on EO. It is a very controversial topic and navigating who to trust isn’t easy. I appreciate your link to the references as well. I was wondering if you had a recommendation for a diffuser. The one I had was great but and I got an awesome deal on it – but now its not in budget. My favorite feature was that you could have it cycle on and off. I have tried a couple others but not found one that works well. whenever I use the oils. Thanks again. Thanks for this, and I think it’s great advice! I’m fairly new to essential oils and have been reading up on internal use because I was leery of trying them that way. Another article said the oils may damage the liver because it gets hit with such a potent medicine to have to filter or disperse. I don’t know about the validity of the claim since it was not on a reliable scientific site, but I imagine liver damage is in the realm of possibilities. What do you think of using a dilution on the face? my facial oil is as follows – Jojoba base I fill about 250 ml, then add 15 drops each rose, chamomile, lavender, and I forget which other ones but they were for skin health. Is that too strong for the face? I also have a pump spray with lavender . I have a lotion I use after the shower and spray one pump of lavender and mix in my hand then rub on my legs. is that acceptable? I seem to do okay with it. You say, “There have been reports of citrus oils causing burns in the mouth or throat, or harming the acid balance in the stomach (because they’re highly acidic).” They aren’t acidic though… The rind of a lemon is not acidic, unlike the inside of the lemon. I’m not saying that all oils should be taken internally, but I am not seeing a lot of evidence for what you are saying. It seems there are a lot of claims on both sides of this issue, with little evidence to support them.